The Hispanic population is the second largest minority group in the United States-and it’s growing. According to the U.S. Census (2000) the Hispanic population is estimated to be 12.5% of the total U.S. population. Currently, there are over 35 Million Hispanics in the U.S. Some areas of the country have much higher concentrations of Hispanic population, and if you live in one of these regions, it is imperative to not ignore this group of clients. At InvestorPro.com you can have a professionally translated site. There are services on the Internet that will automatically translate sites, but they are very unreliable and they are not able to translate images, flash etc. 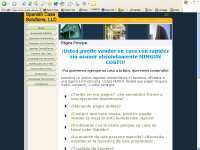 There is a one-time charge of $300 to have an English site professionally translated to Spanish. Other languages are also available - call for quote. The Spanish translation will take approximately 2 weeks to complete from the date of ordering.